The Pittsburgh Penguins have acquired defenseman Ben Lovejoy from the Anaheim Ducks in exchange for Simon Despres, it was announced today by executive vice president and general manager Jim Rutherford. 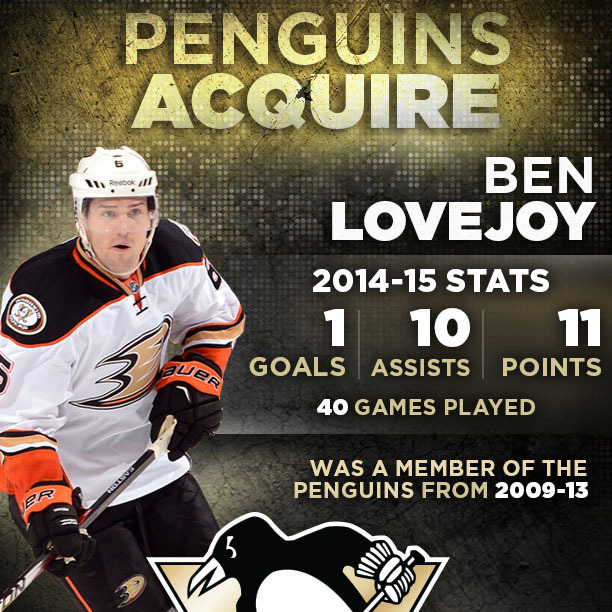 Lovejoy is signed through the 2015-16 season. Lovejoy, 31, returns to Pittsburgh for his second tour of duty after playing 98 games with the Penguins from 2008-13, when he tallied four goals, 21 assists and 25 points. He added two assists in nine playoff games. The 6-foot-1, 206-pound Lovejoy has 11 points (1G-10A) and is plus-3 while averaging 18:33 minutes in 40 games with the Ducks this season. Last year the Concord, New Hampshire native established career highs with five goals, 18 points and a plus-21 in 78 games with the Ducks. His 215 hits led the Ducks and his 150 blocked shots placed second. He added two goals in 13 playoff contests. Originally signed by the Penguins as an undrafted free agent, Lovejoy has skated in 248 career NHL games with Pittsburgh and Anaheim, registering 10 goals, 54 assists, 64 points and a plus-50. He has been a plus player in each of his five full NHL seasons. Lovejoy helped Pittsburgh’s minor-league affiliate, Wilkes-Barre/Scranton, reach the 2008 Calder Cup Final, contributing 10 points (2G-8A) in 23 playoff contests. Lovejoy played four years of college hockey at Boston College and Dartmouth between 2002-07.